Disclaimer: Penelope chose to file this bit of thought a few weeks ago. She has pulled it out of storage for your reading enjoyment. Fingers crossed the data was saved correctly. Somewhere while scrolling through Facebook one day, I came across this ecard that hit close to home. I laughed at myself because I know that this IS ME. 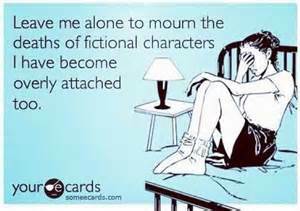 I defiantly become overly attached to fictional characters. Maybe it is an escape mechanism that I’ve developed in my creative mind to help detach from the reality in front of me. Perhaps it is deeper than that and the characters I attach myself to I see myself in, I relate to them, or I long to be them. That would be pretty cliché” don’t you think? But, most of the time I am a walking cliché” anyway, at least by psychiatry standards (insert smile). Of course, in one of my cases I simply became attached at a time of my life that the characters really did speak to me (no, no literally…not even in my case). Actually, if I think about it, all three of these speak to me in one way or another. It may be the darkness and moodiness of some of the characters or it may be the idea of the not so white knight winning out afterall. Whatever the reasoning is, I tend to philosophize about the following works of fiction quite often in my every day life. It all starts with a fictional hospital in Seattle. I grew up with ER and at some point decided it was too depressing for me. “Someone is always dying”, I remember saying in my defense as to why I quit watching. Even in college while having “Friends” viewing nights I always skipped out before Grey’s Anatomy. Then my divorce came and I could no longer stand to watch tv shows that my ex and I had watched together. It was too painful (little did I know it was a relief…I mean, who really needs to watch THAT much South Park?) So, back “in the day” video stores existed and they also rented TV series. So, I made my way through The Sopranos ( an entire blog in itself as to why I understand why Adrianna had to die and agree with it), Desperate Housewives, and Grey’s Anatomy. These shows were all still on TV at the time, so I caught up to whatever the episode was that was actually being shown and that got recorded on the DVR. How is Grey’s Anatomy different from ER? I honestly don’t have an answer. I don’t remember that much about ER but I would think it’s safe to say that it holds no more depressing topics than any of Grey’s Anatomy. I mean, the city it takes place in lends itself to the depressing thought of rain and fog (although there is THAT coffee). So, my long standing attachment to Grey’s Anatomy and Shonda Rhime’s cast of characters began on a blow up mattress (another time, another post) while eating pizza and drinking Jim Beam. Here I am, eleven season in, the ones on dvd I’ve watched at least 5 times each, and I am so overly attached to these characters that I am considering a tattoo of some of the quotes heard on the show. 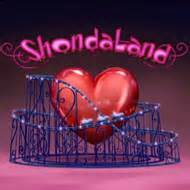 I realize the characters did not write the quotes, but that Shonda sure does know how to tie in the quotes with the characters and emotions. The writing just reaches into my soul in a place that I did not even know existed (Shonda did) and just pulls out parts of me and makes me think about my life in ways I never saw before. (I know-CRAZY) I’m so mad at the thought of MerDer (that’s Meredith and Derrick for you non-Shondaland visitors) coming apart that I don’t know what to do with myself. It’s not divorce, or separating, and hell I UNDERSTAND they ARE NOT REAL PEOPLE. But it’s what they represented for me in my busy mind. Their relationship hasn’t been all romantic comedy. There has been some gloomy times, twisted one might say. To me they represented that love. You know, that love. The kind that doesn’t always make sense but you know just has to be. Okay, so maybe that’s a little romantic comedy like but with a twist. Anyway, after all this investment into their happiness “Mrs. I know everything about writing good TV drama Rhimes” has gone and left me with the question of “is Derrick really leaving?”. Ugh! Really Shonda? Yes, Meredith said “go” because she doesn’t want to be the reason he stays. But, yes she does want to be the reason he stays. But, pay attention now, Meredith wants Derrick to realize that Meredith and said family are worth staying for on his own. YES! The whole thing comes back to the age old communication problem between women and men. Us women want you men to figure it out on your own. Telling you and you doing it is not as good as you figuring it out and doing it. See, I told you….overly attached, over philosophizing. So here is how this relates to ME. If my husband decided to come off the road from driving trucks, I need it to be because he realizes he needs to be at home more. I can’t TELL him to quit driving, he has to come to that on his own. The second attachment issue really isn’t that hard to figure out. I mean good girl (Tara) and bad biker boy (Jax). That story has been told so many ways. I guess that this captured me because of the “mob on motorcycles” kind of vibe Kurt Sutter has going with Sons of Anarchy. And, there was only one more season left of the entire series, so why would you kill off the love story before it ends. Can’t love win out one time? So Tara’s death just reminds you that it can’t. The pure intentions of what was to come from Tara and Jax’s plan seemed like the real deal. The bad boy still paid for his sins and the good girl still could ride off with the off-white knight in shining. But, no! Kurt Sutter had to go and remind mankind that goodness does not win. I’m starting to think if there was a little bid of Oedipus in this whole thing, but then the episode “Red Rose” probably proved that theory wrong. Nothing more to analyze here other than it’s my “bad” side wanting to peep out. The side of me that wishes I could live on the edge more with no regrets. I even have a few items of SOA merchandise I wear from time to time. Then I think, “who am I kidding?”, wearing my Reaper t-shirt driving the minivan wearing gym shorts and New Balance. (That makes me laugh). May be best I don’t live that close to the edge. A meat fork in my head probably wouldn’t help my migraines. And then there are these dang zombies. I resisted the entire Walking Dead phenomena when it first started. I paid no attention to the zombies. Then Netflix hooked me with all the season I had missed, and I watched them, in some kind of zombie like stare, in an entire weekend. Here’s the thing about a zombie apocalypse theme for someone like me. This sort of thing makes my OCD and need to be prepared side kick into OVERDRIVE. I lay awake at night thinking about what I need in my “survival kit” and then obsess that in the reality of it I’m too tired to get it together and really don’t have the finances to stock pile the water and MREs that I need to. 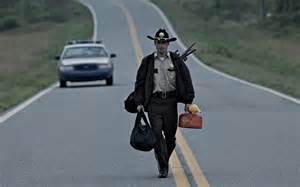 At first I wondered, “really, can this guy Rick not find anything else to wear besides his sheriff uniform”? I sort of thought it was campy and cheesy. The more Rick talked and the dirtier and scruffier he got the more intrigued I got. The heart of it all boils down to his three questions. The more I think about it, it really is that simple. Rick and the gang of zombie killers (ahem, walker killers) portray the basics of what is needed for a relationship. Love, loyalty, and survival. The love and loyalty part depend on how the survival part turns out. There you have it, for anyone that is bored enough to read some of my thoughts, my rationalization behind my attachment to these fictional characters. One also may say it’s because of my extreme empathy. Or you could just chalk it up to being an only child and having one hell of an imagination.